The Rival RCS200 rice cooker will make up to 20 cups cooked white rice, and about 17 cups cooked brown rice. The cooker comes with a steaming basket for simultaneously preparing vegetables, seafood, or poultry while your rice is cooking, making it a good 2-in-1 appliance. The unit also comes with a measuring cup and rice ladle for serving. We hear that the cord is rather short so folks will need close access to an outlet. But, don’t get your credit card out just yet for this model! Several reasons we gave the Rival RCS200 rice cooker a “poor” rating is because during most of our research, we have gathered recurring complaints. This unit burns the bottom layer of rice, has an unreliable and unusable keep warm mode, and simply needs to be watched over. We have heard it also boils the rice at a very high temperature causing under-cooked rice when using the normal 2 to 1 water ratio…so folks may need to add more water than normal. While there have been some good customer feedback concerning this model, the majority of poor feedback outweighs it. We believe that these issues are probably due to a defect during manufacturing and a poorly designed temperature sensor that is suppose to detect when there is little water left switching the cooker to warm mode so the remaining water can steam away while the rice settles giving it a fluffy texture and enhanced flavor. Whatever the case may be, this unit should be skipped. Sure there may be some good HCS200’s out there, but there can also still be some bad batches as well! We recommended folks research other models regardless of the good price this Rival 20 cup rice cooker comes with. —-> Check out the Black and Decker RC866 20 cup cooker which has a similar look. The very fact that folks may need to monitor the rice just in case the keep warm mode fails to kick in is enough to pass it up. And even when it does kick in, it is a little on the hot side causing the rice to dry and crust. NOTE: while it is true that some rice cookers even with a “good” rating have this small problem, it is not to this scale, and those units may only crust several grains…not burn the whole bottom layer ruining the entire batch. Once again, we’re not saying every Rival RSC200 cooker may perform this way, but research from several customer review sites, forums, related blogs, etc., shows us that there are just too many that may. 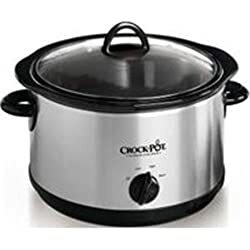 Please check out the “Best 10 Cup Cookers” page for other model selections.